You may have a few business name ideas in mind, but how do you know which one is best? It's something you want to get right the first time. It's certainly possible to change your business name if you need to, but once you've established a business name, changing it can be a lot of work, it can be expensive, and you can lose any brand recognition you've already established. In the course of building a business, you'll make loads of mistakes, but naming your business is one thing you want to get right the first time if at all possible. I changed this website URL and name a few years back. The original name was terrible. I'm glad I did it, but I wish I'd just gotten it right the first time. I spent countless hours making the change, and I still, once in a while, find instances of the old name in places. 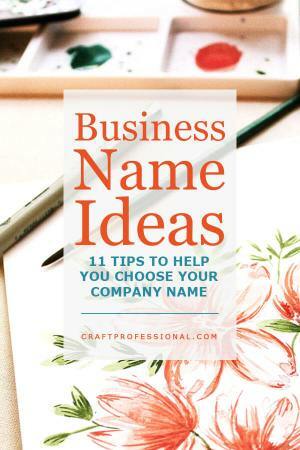 So, in the hopes that you'll be able to get your business name right the first time and avoid my early mistakes, here are 11 tips to help you choose the right name for your craft business. Many artists and designers use their own name as their company name. It can be difficult to be objective about the image your own name projects, so do carefully consider whether your name projects an image that is in line with your company. Using your own name puts you front and center in your business. That can be a real plus for craft professionals since customers generally enjoy feeling some connection with the artist. A downside to using your name, though, is that the business is deeply tied to you, which could limit your options if you ever wanted to sell the business. In many locations, rules are different if you're doing business in your own name vs. a different name. I won't go into legalities here since I'm not a lawyer, but do check with a lawyer, or your local business development office if you need more information about legal implications around naming your business. It can be helpful to be a bit descriptive when developing a name, but keep in mind that your company could easily outgrow its name if you define it by a very specific product or location. For example, imagine you make beautiful handmade leather purses, and you named your company "Purses a Plenty" (Sorry, not a clever name - I know you'll do better). You might regret that name if you decide to branch out into making other handmade leather goods. Be conscious of what is absolutely core to your business. In the above example, it might be purses, it might be leather goods, or it might be something else. Whatever that core component is, make sure it works with your company name even if you change the scope of your business in the future. 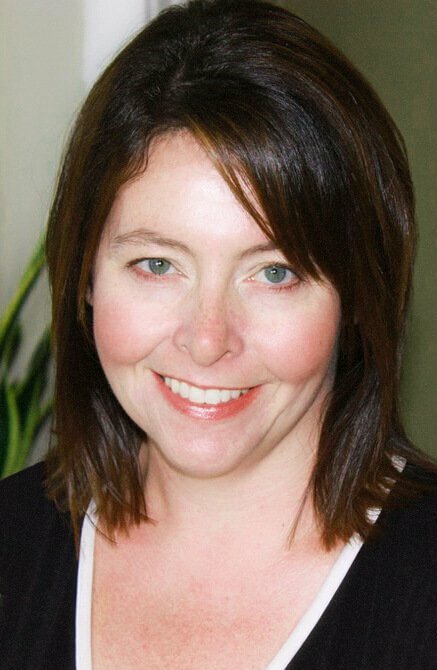 Descriptive business name ideas like "Sue's Handmade Soap" have the huge benefit of clearly defining your company's product or service. Do be aware that descriptive names are often not unique and can limit your company's growth if they are too narrow. These names typically come from uncommon or altered words. They have the benefit of standing out from the crowd and are more likely to be available as a domain name and social media account names. Unique names can convey the nature of your product or service to your customer, but they take more thought and creativity to create. 5. Is the Name Easy to Pronounce? Consider whether any of your company name ideas are difficult to pronounce. One of the ideas I considered when I started selling handmade jewelry was "con fuoco." It's an Italian musical term meaning "with fire." The meaning fit, but the potential for big pronunciation and spelling issues with that name led me to drop it from my list pretty quickly. 6. Is the URL Available? Are the social media accounts available? Even if you're not planning to build a website any time soon, check to see if the domain names for any of your business name ideas are available. So many domain names are taken; you may need to use your company name plus a defining word like designs, studio, glass, soap etc. to establish your domain name. If you are lucky enough to have a name with a URL that is available, buy it immediately even if you don't plan on building a website any time soon. The same is true for social media accounts. Check to see if your business name is available as an account name on the big social media sites and Etsy as well. Create accounts using your name right away to protect it, even if you don't have immediate plans to promote your business on those sites. You may want to be active on those platforms in the future, and you'll be happy you protected your name. Check a search engine for your business name ideas to see what comes up. You may reconsider using the name if there are a lot of results for your name or if there is a similar company with the same or a similar name, particularly if they reach customers in the same geographic region as you will be targeting. Your business development office can help you do a formal business name search once you narrow down your options to the top choices (see #9). Also, reconsider using the name if there is a well known company using a similar name, even if their product is different from your own. If people already connect the name with the existing company's product, connecting the name to your own products could prove to be an enormous challenge. Consider whether the name is being used by someone else in a way that may have negative connotations to your customers. Think through the possible different meanings of the name you are considering and whether it fits well with your target customers. Do your own free market research. Make a list of your top five or ten business name ideas and give it to as many people as you can. Tell them a little bit about your company and ask them to choose their top three favorite names from your list. Track all of the responses and rank your list of names based on the results of your survey. This strategy is a great way to help you with choosing a company name if you have too many good names on your list of possibilities and choosing just one is a challenge. Try to give the surveys to people who generally fall within your target market and notice any trends as the results are returned. You're not bound to choose the top ranking name from your survey of business name ideas, but this process will help you to get some objective feedback on the names that you are considering. A formal business name search will show you whether your name has already been registered. You can also do a trademark and trade name search at the same time. If someone else is using that name or a similar name, you'll need to be very careful about using it yourself. Depending on your geographic location and the structure and type of your company, you may not be able to use the name if it is already in use. I am not a lawyer, so I can't give specific advice on this aspect of naming your company. In this case, some good legal advice could prevent big potential problems in the future. Your local business development office or Chamber of Commerce can assist you in doing your business name search as well as trademark and trade name searches. A lawyer can assist you if you have legal concerns or questions regarding the name that you choose. Before choosing a name and committing to registering the name, use it for a while. Write it in any business documents that you're working on. Say it. Tell your friends and family the new name. Imagine how it could look on your promotional materials. You're going to live with it for a long time, so live with it for at least a few days before you finalize your decision. After choosing a company name, you're finally ready to take a trip down to your local business development office to learn how to register your business name. After spending so much time brainstorming and researching you should have a list of some pretty great words and phrases as well as a sense of how your target market responds to several of those words and phrases. Hold on to your list of business name ideas. Names that didn't make the cut as a company name may become a great name for a product line that you develop in the future. 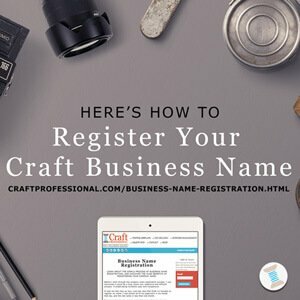 How to register your craft business name. 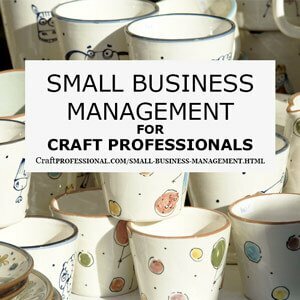 Tips for managing your small business. 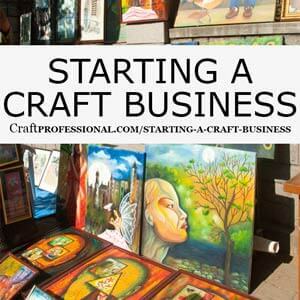 Is your craft business brand new? Get started here.